A "notable" slowdown in manufacturing at Apple's overseas partner Foxconn has been viewed as a potential issue for the iPad maker, and may result in less availability of products. JMP Securities downgraded its outlook on AAPL stock on Wednesday, with the change prompted by a deceleration in manufacturing at Foxconn. Analyst Alex Gauna said the change from "Market Outperform" to "Market Perform" is not a result of concerns with Apple itself, but rather the ability of Foxconn to produce Apple products. "(Foxconn) growth decelerated from 84% (year over year) in the month of December to 37% in January and then again to 26% in February, or levels that are tracking well below the (more than) 70% (year over year) sales growth consensus is looking for in the March quarter, and (greater than) 50% in June," the analysis reads. The firm has accordingly cut its estimates for the second fiscal quarter of 2011 to $22 billion in revenue, down from $23 billion. Consensus on Wall Street is for Apple to report revenue of $23.1 billion, while Apple's guidance is for $22 billion. "We don't know the source of the (Foxconn) deceleration, but possible causes could include simply in-line iPhone sales due to more significant Android competition, weakness in computing products as tablet demand grows, and/or product transition risk around the iPad 2," Gauna wrote. 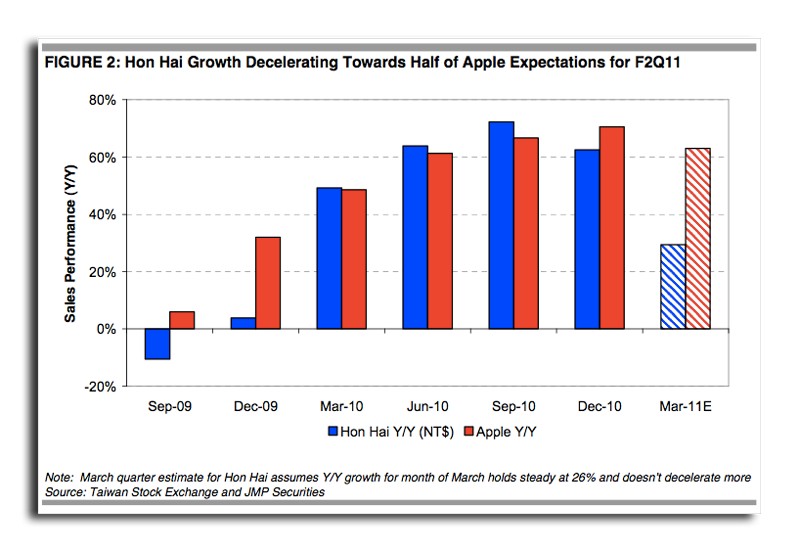 The downgrade is also based on what JMP Securities views as "complacency" on the part of investors over AAPL stock. Gauna noted that Apple has consistently delivered with five years worth of upside surprises in its quarterly earnings, averaging 23 percent. "Recent Street commentary appears biased towards the momentum continuing, with most numbers moving higher around the CDMA iPhone and iPad 2 launches where clear demand trends have yet to emerge," Gauna wrote. The note was issued as Apple continues to experience crushing demand for its new iPad 2 in the U.S., which was launched last Friday. Apple has been unable to keep up with consumer interest, and new online orders are now advertised to ship in 4 to 5 weeks. Also cited in Gauna's note is the recent earthquake disaster in Japan, which forced Apple to delay the launch of the iPad 2 in that country. It was noted that Apple derives 6 percent of its sales from Japan, and key components such as hard disk drives and NAND flash are obtained from the nation.